However, there are several problems with measuring adherence to medical regimes. Firstly, if it is a self-report, there is nothing to stop a patient lying. Secondly, pill and bottle counts may not find non-adherence, but incorrect usage and it would be very difficult to tell the difference without a self-report, which of course has it’s own problems. Biochemical tests, such as blood tests may also be flawed because they can test for drugs, but they cannot determine the frequency and consistency with which the patient is using the medical. One of the better ways to measure adherence to medical regimes is to observe them, however this could lead to demand characteristics which would be not present without the observer and thus become an invalid measurement. Lustman et al (2000) – measured adherence in their research into diabetes and depression. Major depression is present in 15-20% of people with type I and II diabetes. To assess the efficacy of the anti-depressant Fluoxetine in treating depression by measuring glycemic control. A randomised control double-blind study. A double-blind study means that both the researcher and the participants are unaware if the patients are taking the medication or a placebo, an external invigilator usually will know, but will not be able to affect the results of the study. Patients randomly assigned to either the Fluoxetine or placebo group. This randomisation was completed by a computer algorithm. The study was conducted over 8 weeks. 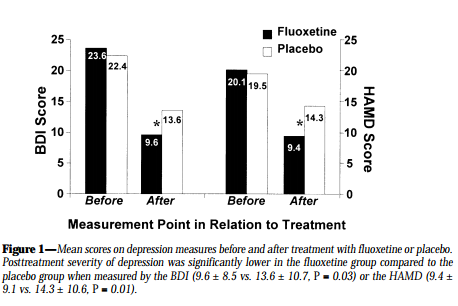 Patients using Fluoxetine reported lower levels of depression. They also had lower levels of GHb, which indicated their improved adherence. Measuring GHb in patients with diabetes indicates their level of adherence to prescribed medical regimes. Greater adherence was shown by patients who were less depressed, and previous research has suggested that reducing depression may improve adherence in diabetic patients. – Ethnocentrism – the sample considered of only people with diabetes therefore we cannot easily generalise the results to other populations. + Scientific – using a double blind study is highly scientific as nor the experimenter nor can the participants confound upon the results. + Useful – the studies results and conclusions are useful for increasing the adherence of patiences.